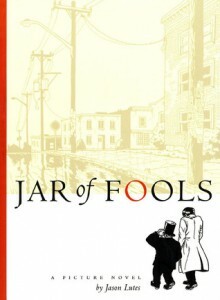 The artistic influences of Jason Lutes’ “picture novel,” Jar of Fools, are fairly easy to spot. The drawing style is European, with the clean lines of Herge of Tintin fame, while the storyline is contemporary Americana of such short story writers as Raymond Carver. But Lutes is good enough, and his story strong enough, that it transcends being merely a reflection of his study, and the combination of the disparete pair make this graphic novel something unusual among the others on the shelf. The story is about a troubled young man whose brother was an escape-artist who failed a straitjacket-river trick, whose romance has failed, and whose stage magician mentor is further slipping into Alzheimer’s daily. At the same time, his ex-girlfriend is attempting to put her life together. When these lives intersect with a young girl and her con-artist father, magic happens–but not the fantastic type, just the magic of people finally connecting to life. I hate to simply keep comparing it to other works, but sometimes the mind just works that way. With its magician characters and realistic depiction of street life, it recalled for me Nicholas Christopher’s Veronica much more than any previous graphic novel. And while the story was interesting and the art entirely appropriate, the sum of it all still left me with a slightly vauge dissatisfaction, likely due to the somewhat downer ending with its open-ended quality (again, reminiscent of modern short stories, where the end is as much a beginning as anything). It’s not going to appeal to action-adventure readers at all, but if you liked Daniel Clowes’ Ghost World or Will Eisner’s A Contract with God, you might enjoy this one.